UNLEASH YOUR CREATIVITY THANKS TO OUR PHOTO CONTEST. Let your creativity speak and participate in our contest by submitting your photograph(s) to win one of the many prizes. 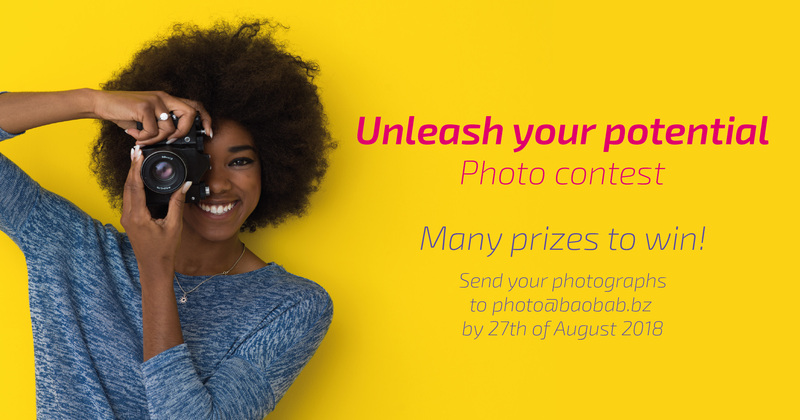 The Baobab Group announces an international photography contest open to amateurs and professionals. The contest will take place from Monday 23rd July to Monday 27th of August 2018 around the theme: “Unleash your potential.” Students, artisans, athletes, artists, professionals or amateurs… It’s time to celebrate people who show potential and champions – whatever their discipline is! In a symbolic or explicit way the photograph should illustrate the theme “Unleash your potential” (entrepreneurship, innovation and/or creation, African youth, pushing yourself further). Deploy your efforts to give your photo its full power! The contest is open to all professional or amateur photographers from the following countries: Burkina Faso, China, France, Ivory Coast, Madagascar, Mali, Nigeria, DRC, Senegal, Tunisia, and Zimbabwe. The contest will result in the realization of a large digital album and a travelling photo exhibition on the theme of dynamic, entrepreneurial and innovative African youth. Participants accept to give the right of use of the sent pictures without conditions and Baobab will be allowed to diffuse them on the internet and editorial documents. The winner will be selected on the 17th of September 2018. Photographs will be evaluated on their technical and artistic value by Baobab’s jury (theme respect and photographic quality). To be on the cover of the 2018 annual report. * Prizes aren’t necessarily cumulative, it depends on the ranking and the final jury’s decision – they will be distributed in October 2018. So ready, steady, prepare your cameras… One, two, three click!